Have you ever wondered why you don’t get the things you desire in life? Have you ever considered that the answer to this question lies in how you asked for the blessing? Do you truly believe you have control over your own destiny? 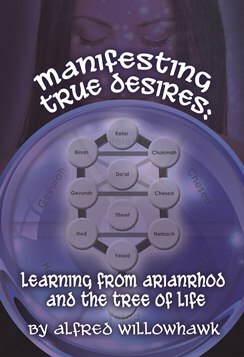 Manifesting True Desires: Learning from Arianrhod and the Tree of Life combines ancient Welsh Traditional learning with a deep understanding of the Kabbalah and together, is a system designed to answer these questions and more, putting the true power of manifestation in your hands. This book has been brought forward to teach a whole new way to work with your own powers of manifestation in everyday life and to assist you in obtaining your own truest desires.